I just had to share this article with you, it's things that I can relate to, how about you? We've all gotten one -- a homemade craft project made with love but not necessarily talent -- a poorly crocheted pillow, a wonky DIY scarf, or a just plain ugly hand-knit hat. 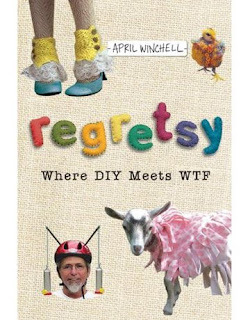 For those heartfelt handmade disasters, there's hilarious blog Regretsy, a collection of some of the strangest and saddest crafts offered for sale on DIY craft site Etsy. We spoke with Regretsy founder April Winchell about her blog, the new Regretsy book, and what makes a bad craft project so good. I have a real appetite for the strange. I always have. Things that are not conventionally beautiful, things that are imperfect, things that are just miss the mark in some way. The only caveat is that they have to done with complete sincerity. If something is self-aware, it doesn't appeal to me as much. When I discovered Etsy in 2007, it was like a dream come true. Sure, there were thousands of beautiful handmade pieces there, but that wasn't what got me excited. What got me was the stuff in the margins, the stuff you'd never see if you weren't looking for it. And every time I unearthed some bizarre treasure, I'd send the link to like-minded friends, and they would reciprocate in kind. It became a bit of a game, to see who could find the most perverse, disturbing, shoddy or otherwise entertaining craft. What do you think drives people to make such incredibly odd objects? Well, I think we're talking about two different types of people. You have people who are aware that they're making weird things, and clearly, they're doing so for the purpose of shocking or amusing people. There's nothing wrong with that. Some people are very good at it. The second type is the one that really engages me - the person that has no idea they're creating anything odd. They're just driven to create, and this is the way they express themselves. What is your all-time favorite Regretsy item? I really love the guy who painstakingly models realistic clay heads of celebrities and attaches them to wind-up toys (I bought one of those myself). I also love the catnip fetus toy, and the fish squirrel taxidermy. And I'm completely enamored with the embroidered toilet paper done by HiBird. I had never, ever seen such a thing before Regretsy, and I've become so fond of it (and her) that I have commissioned specially designed Regretsy toilet paper. She's also working on embroidered maxi-pads to be used as bookmarks for the Regretsy book. Tell us about the Regretsy book. I tried to share some personal things that I thought might bring perspective to it, like my own shameful history as a failed crafter. I'm also proud of my extensive deconstruction of the types or fairy themed crafts made by grown woman who still pretend that sprites live among us. The book does have a selection of Regretsy featured items, broken down by category. Some of them have been on the site, and some of them are new. But that's a smaller part of the book than you might think. I also write about criticism, freedom of expression and the importance of creating your art, even when people don't seem to appreciate or understand you. And I try to do it with humor and affection, because I've been there. And in some ways, I'm still there now. Have you ever had an altercation or run-in with a peeved Etsy seller? Oh, one or two. But there are very few circumstances where I won't take a piece down, so usually just asking me will solve the problem. Surprisingly, the most vocal and unrelentingly nasty sellers are the ones who have never been featured. The stuff they make is just not that interesting, and I think it probably annoys them on some level to see "bad" work getting featured. But the truth is, there is no limelight for people who play it safe. Esty promotes a specific aesthetic on one end of the spectrum, and I promote the other. Smeared & Smudged Blog Hop!